Do you ever have one of those moments where, for no apparent reason, your brain lapses into slumber? And no matter what tactic you try, you cannot wake it enough to procure the information necessary for that moment’s dilemma? I’d like to say that it never happens to me, but honestly… it happens more often than I’d like. I recently went to pick up a prescription for myself at the store. The pharmacy employee needed to verify it was actually me picking up the meds, and not some poor, disillusioned and possibly mentally unstable soul who thought they wanted to be me. She asked me to verify my birthdate. Simple. It’s the label I’ve carried for… several years at this point. So I readily gave her my son’s birthday. And then I quickly realized my mistake and corrected it, giving her my date of birth. At least Creed and I share the same birthday month so, when I gave her that answer it was only off by seven days…and twenty years. I’m pretty sure my mind isn’t slipping, it just doesn’t want to work for answers to questions it thinks are trivial, mindless, unworthy… So, since my mind is somewhat uncooperative, I cannot begin to express my gladness for this great thing called the interweb. Especially the part of it that involves search engines. How did the world survive without being able to google something? Or ask Bing, or AskJeeves or yahoo! or whatever tool you prefer to use. Because I use mine way too often. And for extremely important information. “Bacon Envelopes.” I knew I read something about them, saw them somewhere, but was still in disbelief they could exist. And I couldn’t remember where it was I saw them mentioned. Guess what? Oh, yes! They exist! “Handwriting Analysis.” Let’s just say, I was curious if someone would think I was crazy after I sent them something handwritten. After a brief analyzing session, the conclusion was a disappointing negative. I wouldn’t be considered crazy, but results proved I need to retake 1st grade to work on my handwriting. Or let my dog write things for me. The Number “11” & The Number “28” I have no idea why. Maybe some days it’s just fun to search for random numbers? “Put Out Grease Fire.” I recently decided to butterfly and grill a whole chicken. I’ve done it before, turned out amazing, so of course it should be easy to repeat. Right? Um, maybe not. Everything was going fine, the chicken was on the grill for quite a while. Though I was checking on it periodically, I was mostly leaving the grill to do the work for me. “Holy inferno Batman!” was probably not what I said when I looked out onto our patio and saw flames coming out from the grill. And they were not little flames. I’m guessing the chicken I was cooking was possibly a bit on the pudgy-side, because its excess grease decided to drip and catch fire. 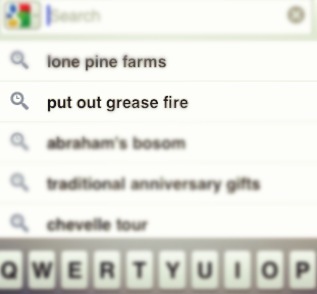 I knew water wouldn’t help, but I couldn’t remember if it was flour or baking soda that stopped a grease fire. Which one? Which one?! My brain refuse to give me a concrete answer to this problem. So I did what anyone in their right state of mine would do. I googled it. Hey, it made perfect sense at the time for me to pick up my iPhone and seek help. And after quickly seeing it was baking soda, the fire was put out quickly and we were able to feast on blackened, er…charred chicken. What have you searched for lately that is laughable? Posted in cooking, fire, frustration, humor, laughs, life, nonsense, randomBookmark the permalink.